Anais Bay Hotel Apartments are located in beautiful, sunny Protaras and make a fantastic getaway for families and couples alike. A haven for beach lovers, you'll find a stretch of golden sand just a stone's throw from the hotel and the traditional resort has a charming ambience, classically styled building, in keeping with the island's architecture and a fabulous pool area. The hotel is famous for its fresh food, peaceful pool scene and tranquil setting. Besides offering a relaxing beach and pool vibe, this hotel scores highly on TripAdvisor for comfy, spacious rooms, facilities and welcoming staff. 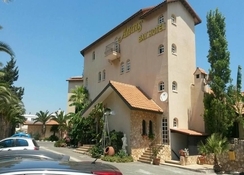 The hotel’s restaurant serves a wide range of local and international cuisines in a pretty open-air courtyard and is well known for its excellent home-cooked food. During the season, the hotel hosts regular barbecues and themed nights to enjoy. For sports lovers there are also tennis courts available in the lush, landscaped gardens. A perfect spot for a laidback Cypriot holiday full of sun, sand and serious relaxation. With a long summer season and balmy winters that often seen cloudless blue skies, Cyprus is a fabulous destination for winter and summer holidays and the Anais Bay Hotel Apartments are the perfect place to escape and relax! 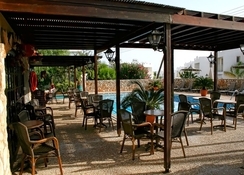 Anais Bay Hotel Apartments ideal location makes exploring the island very easy. They are set back on a quiet side road in Pernera in Protaras, 3km from the resort centre and 5km from Paralimni. The closest big town to the hotel is the renowned party hub of Ayia Napa, which is 10km away, but you'll find a selection of handy shops within a five minute drive of the hotel. The nearest airport is Larnaca at 60km away. And, if you’re with kids, then keeping them busy will not be a problem because Waterworld waterpark is just 15 minutes by car or bus from the hotel. The hotel features various types of room with different types to suit guests' needs. The twin rooms come with air-conditioning, a balcony or terrace and satellite TV. And, to add a bit of extra luxury, you can upgrade to a sea view. All the rooms are comfy, well decorated, and equipped with satellite TV, private balcony, private bathroom, hairdryer, microwave, fridge, kettle, telephone, safe box and air conditioning (payable on-site). 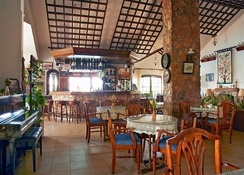 The hotel offers delicious, authentically Cypriot, food, one of the main reasons guests come back to the hotel. The courtyard restaurant prides itself on its menu of local cuisines. But, you can also enjoy a good Sunday roast if you fancy a taste of home, plus, the weekly curry buffets and barbecue nights are a popular highlight. Or why not enjoy the hotel's bar scene and try some exotic cocktails as the sun sets. Evenings at the Anais Bay Hotel Apartments are laid-back and relaxing and there is a pool bar where you can spend the evenings sipping sundowners by the poolside - or enjoy a refreshing fresh juice by day. Guests enjoy a barbecue night every week complete with karaoke for those who like the limelight. The pool comes with a well-stocked bar and a covered seating area to sit back and enjoy freshly-made sandwiches or snacks. There’s a well-lit tennis court in the grounds if you want to get active, or simply stay indoors and play darts or pool in the bar. Outdoor enthusiasts can up the thrill factor by trying watersports such as water skiing on the beach (provided by local companies). Stayed at Anais Bay July 2017 for two weeks on a b&b basis. Rooms spacious and clean. Fabulous shower. Breakfast was yummy. Always something for everyone. Pool and bar areas were great. Only have two negatives - we arrived after 11pm and there was no food available and people staying at the apartments were able to use the hotel pool, despite having their own pool. Wonderful hotel that fulfills all expectations - particularly loved the personal service provided by the very courteous owners. It was one of the best holidays I have had.The staff were brilliant the accomadation was good.I met some great people.three cheers to all concerned. Lovely position very close to the beach with excellent staff at the appartments. Pools clean and welcoming, we only ate at the hotel twice but were rather disappointed with the food and lack of atmosphere. Plenty of places to eat out close by. Apartments are clean but basic.